© 2019 The smile of Thales. A website about uncertainty, convexity in Finance, Computation and algorithmic. According to Stoic philosophy, ataraxia is the state of complete absence of trouble, where the sage becomes insensitive to any trouble and by extension to the volatility of his environment. Even though the Stoic does not necessarily “benefit from disorder” (or becomes Antifragile as NN Taleb puts in), it remains robust or resilient. Our point here is to see whether CVA (as well as its other derivations DVA, FVA…), as a measure of counterparty risk could be comparable to ataraxia for the Stoic sage. In other words, when properly used will CVA be likely to annihilate the counterparty risk? Is there a possible dynamic replication that authorizes the use of risk-neutral measure to calculate the Expected Exposures? What could be the practical challenges to dynamic hedging? In the previous material we presented the Standard Credit Support Annex pricing, the impact on Zero-Coupon Interest Rates Curves calculation and thus on Interest Rate Swaps pricing. We also showed up the different shortcomings and issues that could arise from collateralization and that in spite of undisputable advantages a significant portion of exposure could remain unprotected and subject to fat tail event such as default. Collateralization is structurally imperfect and this is the starting point of Credit Valuation Adjustment (CVA). In this perspective we could envisage CVA as the amount one party could lose on a deal or a set of deals against a given counterparty in case the latter was to default. This amount is therefore likely to be paid at the trade’s inception as an upfront payment or as running spread or Par Rate adjustment with regards to unadjusted calculations. We will define these parameters one by one. As we discuss in another article, the existence of a Collateral Agreement with a given counterparty can have a crucial impact on the risk mitigation. In theory, the case of a bilateral CSA with 0 thresholds/MTA and daily margining annihilates the counterparty risk as the collateral posted will completely offset the MtM movements. There will always be a period between effective default and closeout (when the instrument can be replaced on the market), called Margining Period of Risk which is usually lasting from 5 to 20 business days. A lot of counterparties do not have a CSA with 0 thresholds/MTA and daily margining, because unlike banks they are not used to borrow/lend important amount of cash or securities. Non-0 thresholds/MTA and non-daily margining leave a remaining level of exposures. In practice, a bank’s OTC portfolio is a mixture of several types of CSA (bilateral with 0 threshold/MTA daily margining, non-0 thresholds, unilateral, infinite thresholds…). For all these reasons, we have to account for a counterparty risk through CVA. However, the CVA amount will be potentially highly reduced by the CSA. The exposure corresponds to the value of expected cash-flows that one entity can lose in case its counterparty was to default. Counterparty risk exposure typically concerns OTC derivatives and repos. Since the exposure is a function of expected cash-flows it highly relies on the derivative contracts. Exposure can be bilateral, as either entities can owe cash-flow to its counterparty (this is the case for a swap for instance). The exposure can also be strictly unilateral (for example, in case a bank sells an option contract where the premium is paid upfront by its counterparty). 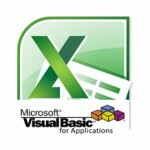 When it comes to price the CVA value, the appropriate measure to calculate the exposures is the Expected Positive Exposures (to get what the counterparty is owing to the calculating entity) and the Expected Negative Exposures (to get what the calculating entity is owing to its counterparty). Other measures of exposure can be useful for other risks or regulatory calculations such as Potential Future Exposures, Effective Expected Positive Exposures. As a Swap is a bilateral contract, it is likely to evolve in one way or the other depending on interest rates movements. We assume that there is no CSA contract between the two entities (for instance a bank and a corporate) and that at a given time the MtM of the swap portfolio is 0. We assume that one year after the trade date, the MtM of the portfolio is going in the wrong direction with regards to calculating entity (i.e. the bank) by -1M. This means that one year after, the corporate exposure is +1M and the bank -1M. If the bank was to default, the corporate would lose this amount, and if the corporate was to default, the bank would have to owe this amount to corporate creditors. This exposure is purely static and is the result interest movements at a given date. As CVA is likely to be settled for once at the beginning of the trade we will have to calculate it as a projection of the underlying variables. Since the latter are stochastic we definitely need a model to estimate them. The Swaps exposures have to be divided in two exposures with regards to which party is calculating the risk. 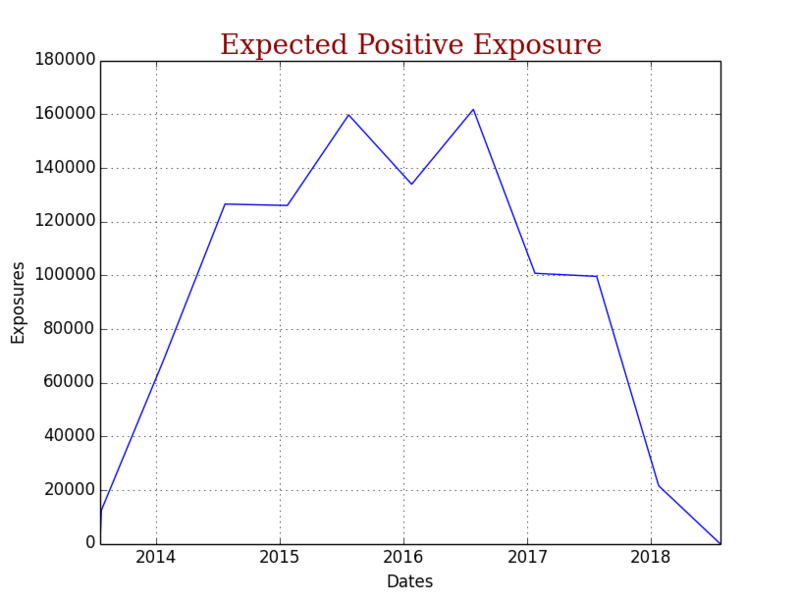 Expected Positive Exposure (EPE) is the exposure owed by the counterparty and Expected Negative Exposure (ENE) is the exposure owed to the counterparty. The sum of the two makes the Swap Expected Exposure (it could be positive or negative depending on EPE and ENE amounts). CVA will depend on the EPE at each potential default time; default is likely to occur at any given time. However to make things more simple we assume that default occurs at a discrete set of dates (it can be cash-flow dates for example). Let’s assume that there is only Swaps vs. 3M Euribor in the book. The bank will be receiving the Fix Rate annually, so the Expected Positive Exposure on an annual basis. Conversely if CA CIB is paying 6M Euribor, BNP will compute the Expected Positive Exposure on a semi-annual basis. Then, there are two options, either we assume the default to be anticipated (i.e. the beginning of the Cash Flow period will be used as calculation date) or the default will be postponed to the end of the CF period. , is the expected value under Q measure. As we rely on risk-neutral pricing and probabilities (a clear distinction with historical probabilities usage has been done by Damiano Brigo in the more than essential paper Counterparty Risk FAQ), we will use the usual pricing measure Q.This implies that we will treat any expected exposure as if we were pricing a derivative transactions. The latter is actually related to IFRS 13 which leads to consider the fair value of assets as an “exit price” and therefore implies that we use models calibrated over market data (e.g. implied volatilities and default probabilities) instead of historical data. , is the positive part of the Mark to Market of the whole OTC derivatives transactions (aggregated in a netting set) against the counterparty. , is the negative part of the Mark to Market of the whole OTC derivatives transactions (aggregated in a netting set) against the counterparty. On the previous formulas there is no exposures reduction mechanism linked to a CSA as we assumed there were no CSA between the two entities, however we assumed that there was a netting agreement. Examples of CSA-linked exposures are described in the CSA document. In this case we assume a pure uncollateralized deal; we also assume that the 6M Curve is the treasury desk curve. We can see the similarity between the previous formula and the pricing of a payer swaption. 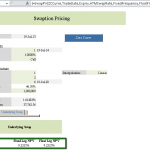 Indeed, calculating the exposure over a swap with maturity at given date is equivalent to price a swaption where the strike is the rate R, with as option expiry and swap start date and maturity. Alternatively, calculating the exposure can be seen as assessing for the replacement cost of the underlying swap (after the closeout procedure). 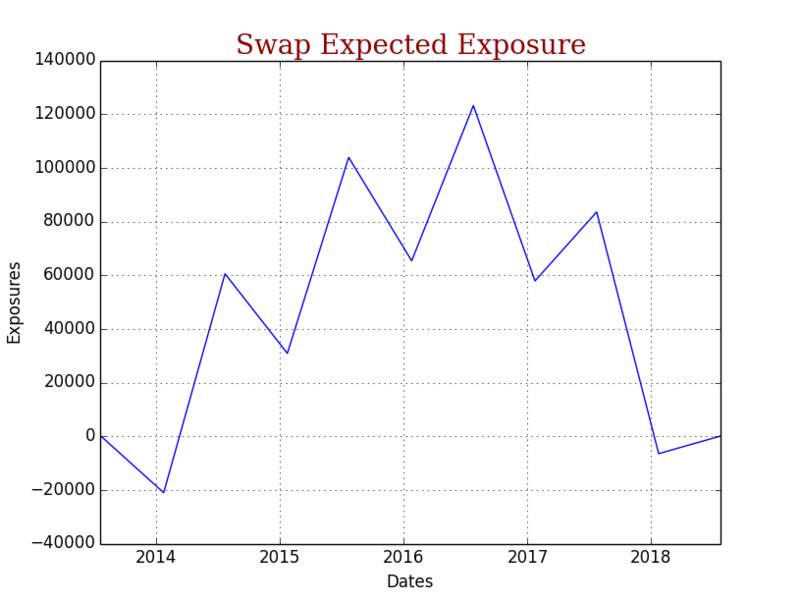 Here is the typical exposure profile of a 5Y annual paying swap and receiving the floating rate semi-annually (start date is 23rd of July 2013). Expected Positive Exposure is gradually increasing as a ramp to reach the highest point at the middle of the swap lifetime. This can be explained as replacing the swap during the first year (i.e. between the 19th of July 2013 and 19th July 2014 is not expansive. The Swap starts at the money (NPV is generally 0), so as rates are moving Mark to Market is likely to fall progressively into in the money territory and the risk of losing part of the MtM is getting higher (or alternatively the Swaption over the Swap is likely to be exercised). The Exposure is progressively declining between year 3 and year 4 as there are almost no remaining Cash Flows and therefore less risk to lose any MtM. 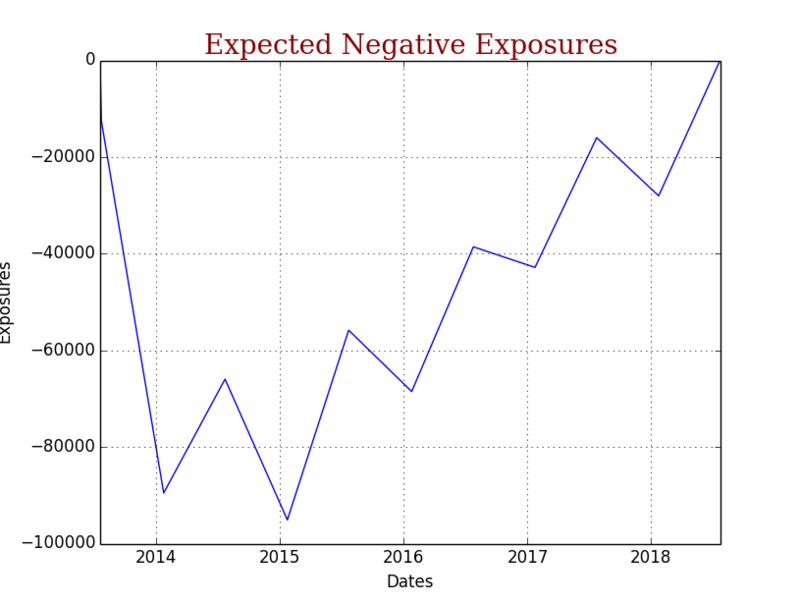 Expected Negative Exposure profile will not be the exact opposite of EPE because of timing of payments (annual vs. semi-annual) and because the party is exposed to lose a fixed and almost deterministic amount of CFs – Indeed the only variable parameters will be the set of Discount Factors. We can see that the peak exposure is falling around 3 years after the start date. This can be explained as providing the shape of the forward curve, the greater the maturity, the higher the forward rates. The estimation of counterparty credit risk is likely to be done throughout the use of Default Probabilities, in theory we could have the choice between two main sets of data, market and historical. The latter are typically based upon data provided by agencies or internal models, whereas the former are derived from quotations. Recent accounting standards such as IFRS 13 imply the use of market data to compute the CVA for accounting purposes (vs. CVA capital charge for regulatory standards). Therefore, we will focus on the approach based on market data. How to use Default Probabilities ? The Default Probabilities will be used to estimate the potential default of the two parties along the swap lifetime. Even though default can occur at any time, a common practice is to use the Cash Flow dates as discretization scheme. 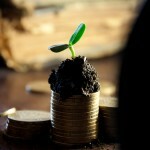 This implies that default would be either anticipated at the beginning or postponed at the end of a Cash Flow period. Default Probabilities are likely to follow the same logic, so under this assumption, what will be retained is the differential of Default Probabilities between the Start and End date of a given period (also known as marginal Default Probabilities). What kind of market data should we use then ? Since we want to compute CVA for market purposes we will use the market data and therefore rely on market Default Probabilities rather than on historical probabilities. Ideally, Default Probabilities should ideally be derived from the set of CDS single name spreads of the two entities as the latter is encompassing the most accurate information on the credit risk. However, since this information is not always available or even liquid enough (especially for smaller corporate entities). We can also rely on credit risk derived from Bond quotations through Z-Spreads or Asset Swap Spreads. In such case the credit component can be extracted from the Bond and converted into Default Probabilities. This approach should not be used directly, indeed for instance Asset Swap Spreads encompass a funding component (through the purchase of Bond Notional) that should be removed from the spread value to get pure credit risk information. Also Bonds quotations can be highly illiquid. One can use the information derived from similar entities with equivalent credit risk, but more generally from CDS baskets that would be assumed to bear the same type of credit risk. CDS basket should be tailored-made from CDS single names quotations to match the three criteria: rating/sector/geography. Credit curve assignment should be done carefully so that the credit risk for a given counterparty should not be underestimated. Another core aspect of counterparty credit risk that has not been adressed so far is the Loss-Given Default (LGD). It corresponds to the portion of MtM that cannot be recovered and is therefore equal to 1 – RecoveryRate. When they are quoting CDS spreads, contributors are also quoting the LGD (generally 60\%) which would be considered as the Market LGD. However, for specific counterparties banks can tweak the LGD to adjust it to their expectations, typically for Sovereign entities, the LGD is generally lower than 60\% (a greater Recovery Rate is expected). Default is deemed to occur at the end of the period (we assume it will be “postponed” in case it happens between two Cash Flow dates). Recovery Rate/LGD is assumed to be deterministic and constant over the Swap lifetime. 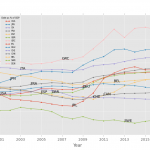 No correlation between the credit risk of the counterparty and the exposure (i.e. no Wrong/Right Way Risk). The calculating entity is assumed to be risk-free during the lifetime of the operations. (this hypothesis can be relaxed by introducing the first to default check and the survival probabilities of the calculating entity). The EPE, follows the same logic as what is described in the Exposure section. Under these assumptions, CVA can be summarized as a weighted-average Exposure (weighted by the default probability differential from the start and end date of each period). Wrong-Way Risk (WWR) is arguably the trickiest component of CVA, there are actually two types of WWR, the specific and the generic. We won’t discuss much of the specific WWR here but rather the generic. In a nutshell specific WWR is typically triggered when there is an explicit link (in the juridical sense of the word), between the counterparty and the underlying components driving the exposures. For instance, let’s say a bank is trading an equity swap with an entity where the underlying stock is the stock of one of its subsidiaries. Generic WWR has a much wider scope as it is encompassing the correlation (potentially hidden) between the underlying components of the exposures and the credit spreads. We define this risk as Wrong-Way when the correlation has a negative impact on the trade. Right-Way Risk refers to the opposite, when the correlation is mitigating the impact between credit risk and exposure (J.Gregory is rightly pointing out that we should not refer to as a “risk” but rather “right-way exposure”). We can distinguish two types of correlation, global and idiosyncratic. Global correlation is referring to the risk that could affect any type of counterparty. For instance if we assume that when the level of interest rates decreases (because of an economic recession) the default probabilities/credit spreads are likely to rise, then a Receiver Swap is exposed to Wrong-Way risk – this is because I am getting in the money when rates are moving down which is increasing the Expected Positive Exposure and the default risk. Conversely, a Payer Swap will keep me out of trouble of Wrong-Way Risk – the EPE will increase when rates are moving up and decrease when moving down. The previous statement “when the level of interest rates decreases (because of an economic recession) the default probabilities/credit spreads are likely to rise” could not be true in any situation (an upward movement in interest rates could also lead to liquidity issues and potential failures) and therefore is not likely to be applied to any type of trade. Idiosyncratic is linked to the particular risk of a given counterparty. One classic example is the case of exposures where the underlying asset is a sovereign bond and the counterparty a bank of the same country. For instance, let’s say the calculating entity (a bank) is dealing a reverse repo with another bank from a emerging country and the underlying asset is a sovereign bond of the same country. It is quite common to have tied links between banks and states within a same country but these links can be quite strong. Thus if the bond falls because of the country credit risk, the Default Probabilities of the counterparty are likely to rise. At the end of the day the main issue remains, how can we determine a relevant correlation between credit risk and exposure? Unfortunately there is no such thing as CVA quoted on the market so that the correlation could be implied. If one day Contingent CDS were to be quoted for major trades (on USD or EUR IRS against 3M Libor/Euribor for instance) and for a given rating we could envisage to imply WWR from CCDS price. For banks without internal CVA model, Basel II committee stated that Wrong-Way Risk would be calculated throughout a (positive) alpha multiplier of 140\%. In such case CVA would be 40\% higher than without WWR. Banks with their own model would be required to apply a 120\% floor on their CVA to account for WWR. Brigo, D. (2011). Counterparty Risk FAQ: Credit VaR, PFE, CVA, DVA, Closeout, Netting, Collateral, Re-hypothecation, WWR, Basel, Funding, CCDS and Margin Lending. Taleb, N. (2013). Antifragile: Things That Gain From Disorder. Random House Trade Paperbacks. Gregory, J. (2010). Counterparty Credit Risk The New Challenge for Global Financial Markets. Wiley Finance.